so… Since my last post I’ve been getting underway with my thesis. I’ve been looking for references, cross-referencing my bibliography, reading, taking notes and just generally keeping my brain busy. I must admit since looking again at the photos from the MCM exhibition, I have been trying to improve my skills with the watercolours. Mainly because of Sean Phillips great work. Obviously my work is nowhere near the standard but I have been having fun just putting colours down on paper. I also spent Monday at the West End of London with my brother (whose work was seen in some of the pictures) we went up to forbidden planet to browse through some graphic novels and to try to pick up some cheap Halloween items that could make next year a bit cheaper for me. Unfortunately there was nothing that really took my fancy there although I did look at some great art books featuring the work of toy story three. I was also tempted to pick up a signed copy of the Simon Pegg book that was two-pound cheaper than in Waterstones. this is one of the experiments that I created whilst I was waiting for photoshop to load up. it was created just using a basic set of watercolour paints on top of normal printing paper. The image was then defined using fineliner pen I think for an experiment it came out quite well hopefully next time I’ll be up to incorporate marker pens into a watercolour painting to see how that comes out. I’ve always wanted to become proficient with watercolours as I’ve always enjoyed using although personally I usually get annoyed when the paint doesn’t do what I want it to. 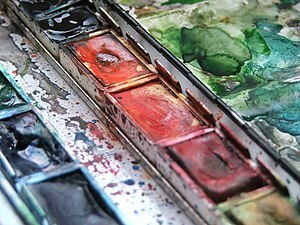 I guess I have been spoilt by using oil paints as it seems to follow what my mind is saying more than watercolours. I have been advised by illustratingKay to just relax and enjoy the paint so that’s what I’ve tried to do. I’ve also posted the image as well as some others at my deviant Art which is where most of my experimentation seems to be posted. if you want to have a look just go to www.KIERZ.deviantArt.com and have a look. so far and 1100 words into my essay and I must admit it’s going quite well. the journey to Colchester yesterday gave me a bit of time to write some notes in a notepad which has given me a lot more room to right down my ideas. cheers for reading. checkback soon.